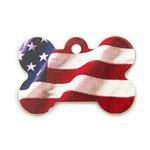 Show your love of your pet and your country with a Bone Large Engraveable Pet I.D. Tag and bring them home! The Bone Large Engraveable Pet I.D. Tag with the US Flag will ship to your door, ready to use. Don't let your pet leave your house without I.D. so they know how to get back. Made with a brass metal base then painted on front and back. The front features a photo-real image of our waving American flag. The back features a navy base framed in red with tiny white stars for a very patriotic look. Your pet's information will show up nicely against the navy blue background for sharp legibility. This American flag bone-shaped dog I.D. 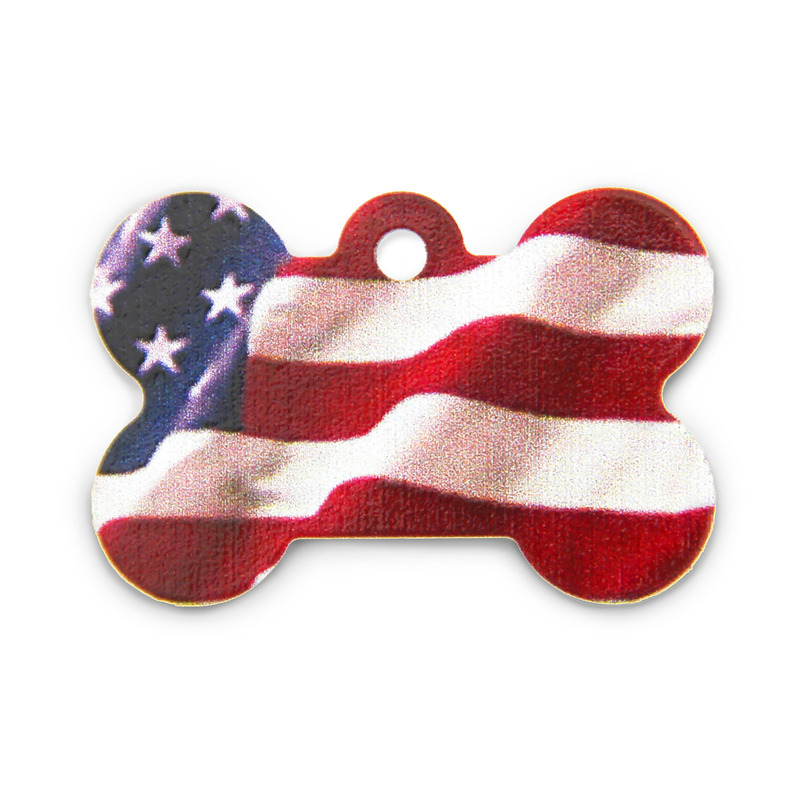 tag is ideal for any patriotic occasion but is ideal for every day that your pup is proud to be an all-American dog. 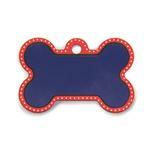 It's a great way to get your pup noticed and to make sure they can always find their way home. Try pairing this gorgeous pet I.D. tag with a red or blue collar or look for our patriotic leashes and collars for the ultimate support of our troops and country. Look for other charms to enhance your tag's bling. Proudly made in the U.S.A.
Posted On 07/27/17 by Alice R from Rockville, IN Yes, Alice R recommends this product! Posted On 04/05/17 by Natalie M from Los Altos, CA Yes, Natalie M recommends this product! I received my purchase about 3 days after ordered. I couldn't believe a personalized item arrived so quickly. It is the perfect size and looks well made. Posted On 03/29/17 by Dr. Isaac R from Ermington, Yes, Dr. Isaac R recommends this product! Posted On 12/20/16 by Jane R from , Yes, Jane R recommends this product! Posted On 07/13/16 by betty g from round rock, TX Yes, betty g recommends this product! Posted On 07/05/16 by William K from Myrtle Beach, SC Yes, William K recommends this product! I purchased the stars and stripes engraved Pet I.D. Tag to compliment the collar of my Doberman. Being a former military man and a forever Patriot, I believe it does just that. My only question is whether or not the paint will chip off from the other tags on the collar. It hasn't happened yet. I guess time will tell. The engraving looks great. Posted On 02/23/16 by Marilyn D from Staten Island, NY Yes, Marilyn D recommends this product! I have purchased a number of ID tags and this is by far the best one yet. It is absolutely gorgeous. I will definitely get another one as a backup. Posted On 02/10/15 by BettyB from Vernon, CT Yes, BettyB recommends this product! Posted On 12/17/14 by Megan L from , IN Yes, Megan L recommends this product! Smooth purchase from order to delivery!